Does anyone know a source for the Tire Pump Leather Cups? I would like to rebuild my pump without all the extra gear you have to buy with the kits. Looking through the old posts I see a Clay Atkins might have made some in the past but his email address is no longer valid, nor is his Forum Profile. I hope he is still with us with or with out the leather cups! If you want to purchase a Tire Pump Kit from the parts supply houses please note that: The kits come with a smaller diameter piston rod, Smaller outer diameter hose (Can't use the original hose clamp with flat head screw near the bottom), a little different wood handle where the rod goes through (secured with a nut on top) and a Pump top that is fitted for the new diameter pump rod so you can't use your correct Ford Part Number Top. I guess it would be a nice kit if all you had was the brass body and Base. I have taken a scrap piece of leather from other projects and made my own leather cup. If you don't have any leather around you can get it from a craft shop. I cut it in a circle larger the the pump body punch a small hole in the center to attach it to the rod, add a small washer to each side of the leather, and attach it to the rod with a small nut. Soak the leather in oil for a day then fold the leather down into the main pump tube add a few more drops of oil and it seals nicely. Screw on the top of the pump and your good to go. "Soak the leather in oil for a day." Best to use is neatsfoot oil. I'll be a farm supply would have them. I've used leather cut out of an old leather shoe for tire pump cups with good long lasting results. That's what any handy old-timer would have done in the day. "Clay Atkins ,from Bridgeport,Illinois makes new leather cups for the pumps. They run @$6 apiece . his email is atkns82@shawneelink.net"
That email address is no longer good. I tried to send him a message and it just gets kicked back. They are known as "cup leathers" and you can find them on the internet. I bought mine from Lehman's. Thanks for the website Greg. What size did you use? Should the outside diameter be larger by some degree than the brass tube or the backing washer? I think the diameter on my rod is 1/4" to get over the threads 3/8 dia on the rod itself. The backing washer is about 1 1/8"
Have you tried a bicycle shop ? I found a new leather seal for my speedster's hand pressure fuel pump at a bike shop. This was last year and they had 5 or 6 sizes. I read an article somewhere about how cup leathers were sized, but I can't find it now. Maybe someone with this information will chime in. The gist of it is that you order the leathers by the i.d. (or o.d.?) of the tube and the leathers are sized correctly for that tube (they are slightly large). I ordered 3/4"x3/8" and 1-1/2"x1/2" for my duplex tire pump, but I haven't installed them yet as I have some silver soldering to do on the tube. They look like they're the right size, just snug in the tube; should fit tightly once they're assembled on the piston rod w/washers. Depending on which company you order from, you may have a choice of tanning processes, treatments or materials. Avoid chrome tanned leathers for any application where the leather may come in contact with oils. Greg: Thats great info. I hope you can find that article, I would love to know more about the cups and process. I will keep looking around. Bob thanks for the the info. Bob do you sell just the pump cup leather separately? It's a great kit and does work but there are some drawbacks people should know. Here are some issues with the kit. If you want to purchase a Tire Pump Kit from the parts supply houses please note that: The kits come with a smaller diameter piston rod, Smaller outer diameter hose (Can't use the original hose clamp with flat head screw near the bottom), a little different wood handle where the rod goes through (secured with a nut on top) and a Pump top that is fitted for the new diameter pump rod so you can't use your correct Ford Part Number Top. The supplier that sells the kits to the parts houses does not want to sell the Leather Cup separately and that's a business decision,I understand but wish was not the case. Here's a counter display of tire pump gaskets I posted a while ago under accessory of the day. Do you know the correct size to look for? The guy whose mug is on that card look familiar "you dirty rat"! Notice on the display card it says "saturate with light grease - do not oil". So is it that grease provides a better sealing surface between the leather and the tube or the oil would make the leather to squishy ? Thanks for pointing out that one should use grease instead of oil. I was always taught to use oil and that is what I suggested above so I hope they didn't use oil yet. I will now start to use a light grease, any suggestions on type or weight? Seems to me I read somewhere to pore a little oil down the cylinder to keep the leather pliable and help seal. 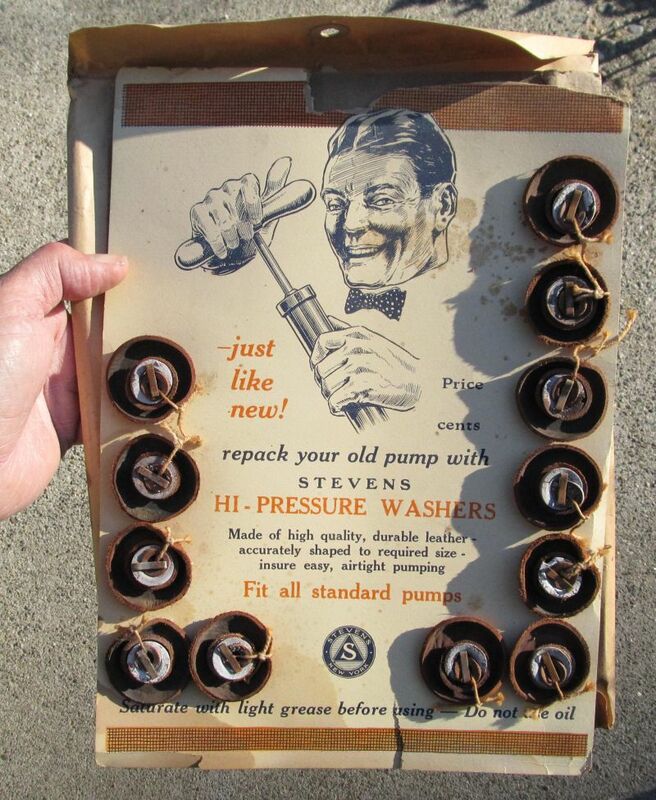 Then again, could be for the Colman stove pump seal that I remember that from.